The Institute for Fiscal Studies’ (IFS) analysis of the specific measures in the Autumn Statement shows a certain degree of frustration. From their (economists) perspective, there seems no unifying theme or direction. For example transferable allowances for married couples adds a complication to the income tax system, without providing a major incentive. Free school meals for all children in the first 3 years of primary school benefits better off parents, as those on low incomes can already claim. And then there is the continuing squeeze on the size of the state. The government has already reduced the share of government consumption in GDP, but that is nothing compared to its plans for the next five years, as I note here. It is pretty clear that both the IFS and the OBR regard this plan as incredible - it just will not happen. So what is the point in putting forward a plan for an unrealistically massive cut in the size of the state? I am sure both organisations know why, but cannot say. It is, as ever with this Chancellor, all about the politics. For example, when it comes to the specific measures, the married couples allowance is an attempt to neutralise the impact on some conservative supporters of the Prime Minister’s support of gay marriage! Other popular tax giveaways are funded by ‘cracking down’ on tax avoidance - a win-win combination in political terms, even if the numbers might be unrealistic. In terms of the big picture, the Chancellor wants to ensure that Labour cannot pledge to match his spending, tax and deficit plans. As a result, he will be able to go into the next election accusing the opposition of either being dangerously imprudent, or planning tax increases. Is this not a dangerous hostage to fortune? If the Conservatives win the next election, will this mean that they will have to admit their previous plans were hopelessly unrealistic? Perhaps, but I suspect the OBR’s assumptions about the output gap will be too pessimistic, and so economic growth will bring larger than expected falls in the debt to GDP ratio. So even if the Chancellor does not achieve cuts in government spending on the scale planned, deficit targets might still be met. In a rational world (i.e. one where the economics made sense) the opposition could argue that the government’s plans aimed to cut debt too fast. But the ‘too far, too fast’ argument has already been judged to have failed by the political class, which has swallowed the myth that Labour’s fiscal policy played a large part in creating our present problems. So Osborne hopes that his unrealistic plans will paint Labour into a difficult corner, and the LibDems for that matter. Yet it is far from obvious that this trick will work this time. Labour can take these numbers at face value, and say that they can only be achieved by cutting funding to the NHS, or education (see Declan Gaffney here - HT Alex Marsh). While government austerity may (perversely) be accepted in bad times, when the economy is growing it may be more difficult to argue that we cannot afford to maintain existing levels of public spending. The government’s attempts to gain political advantage where none should lie also tie its hands. Labour’s major theme at the next election will be the decline in living standards for most income groups. This in turn is largely down to the UK productivity puzzle. It is not obvious that this decline in productivity growth is the result of government actions. Yet, as I note in this Free Exchange piece on the Autumn Statement, the government’s attempts to claim credit for growth in employment means that they cannot publicly address the subject of the productivity puzzle, still less argue that it is none of their doing. Here is a slightly amended graphic from my Free Exchange commentary that might look good on a Labour Party election billboard. So the battleground for the next election is set out. Labour will argue that living standards have shown an unprecedented decline (true), and the fault for this can be laid at the government’s door (half true at best). The Conservatives will argue that austerity has enabled the economy to grow again (false), and that continuing growth requires yet more austerity (completely false). Which will win out will be fascinating if you are interested in political spin, but it will all be pretty excruciating for any macroeconomist. 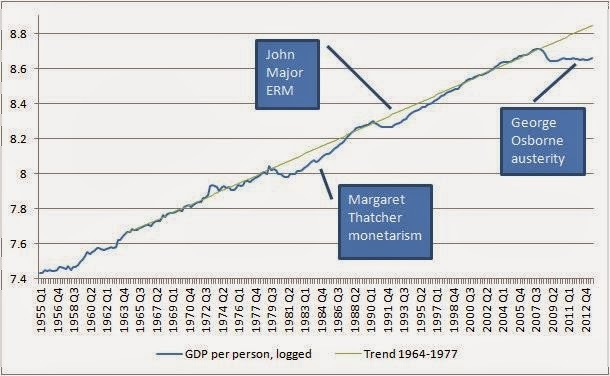 "The Conservatives will argue that austerity has enabled the economy to grow again (false), and that continuing growth requires yet more austerity (completely false)." You make it too easy for yourself with this (as do others like Krugman, who argue a take aim at 'expansionary austerity'). Nobody, but nobody denies that running a looser fiscal policy leads to higher short term. growth. Treating those who disagree with you on fiscal policy as dunces who cannot grasp this, just makes them stop listening. I agree; I think that it is dishonest to claim that the advocates of austerity present it as being primarily aimed at stimulating economic growth - that is a Keynesian straw man. It would be more accurate to say that conservatives' justification for austerity is primarily to tackle large fiscal deficits and resulting growing debt - whether the origin is pre or post financial crisis - but that they argue that a by-product might be a confidence-driven enhancement of economic activity as the threat of a "sudden stop" debt crisis is reduced. A sudden stop of pounds created by the Bank of England? Or do you think pounds are printed in China? @P, not that canard again - I refer you to my comments on the previous post. The BoE is I.N.D.E.P.E.N.D.E.N.T. I doubt that it would openly over-ride its monetary policy to prevent a rise in gilts yields to, say, 7%. It might intervene against a debt crisis of Greek magnitude, but maybe not of Spanish magnitude. At the risk of polluting Simon's blog further, as has been noted in many reputable blogs - those who make comparisons between the UK (or any other sovereign) monetary system with the Eurozone don't know what they are talking about. Tim Young, the problem is not that it is a canard. The problem is that you do not understand. The fact that BoE is "independent" makes no real difference. It's aims: monetary stability, financial stability, 2% inflation, growth, etc, are *not compatible* with a government "debt crisis", out of control interest rates, or too-high interest rates. If any of these things were to happen for some reason, the Bank would be failing to achieve its goals and would have to intervene. Government bonds are utterly central to the entire £ monetary and financial system. What you need to understand is that a single currency zone like the UK is a closed system. The pounds have no where else to go. Unlike the Eurozone, where euros can literally drain out of one country and into another. In the UK the re is only one central bank and one government issuing sovereign bonds. If you have pounds, the only sovereign bond you can buy is issued by the UK government. Why do I have to buy sovereign bonds? Other assets are available. (1) Banks do not need "risk-free" collateral when dealing with the BoE; in fact, they don't even need sterling collateral. The haircut applied to the collateral is at least as important as the "quality" of the collateral. But presumably a debt crisis implies too much sovereign sterling debt anyway. (2) The BoE has no statutory responsibility for ensuring that UK govt debt is "risk-free" - that is the essence of this argument. In fact, BoE is legally obliged to give priority to its price stability objective. The idea that central banks act as lenders of last resort to government is an invention of the post-financial crisis era. Of course, this view is fundamentalist, but the point is that there are constitutional speed bumps that make it uncomfortable to have the BoE supporting government borrowing - probably prompting the fall of any government which gets itself into that position - so we won't go there lightly. Er no, Tim. The Bank of England was originally created to finance government. It's certainly not an "invention of the post-financial crisis era". If there were a sovereign debt crisis the BoE would be obliged to intervene to prop up the value of sovereign debt because of the threat to sterling. That would be entirely in keeping with its price stability mandate. OK, Frances, I challenge you to find me any pre-2008 mention of central banks being the lender of last resort to governments. I am not sure that the origin of the BoE in 1694 is relevant today, but if you insist, I believe that the BoE's original loan to the government was made in specie, at an interest rate of 8%, so if the BoE demand the same terms now, I won't complain! While you may be right that the present MPC members might find excuses to try to help the government to avoid a crisis, it would stretch credulity to claim that creating base money to buy gilts would be an appropriate response to a "threat" to sterling! Seeing that the BoE is owned by the government and the governor and board are appointed by the government, it seems to me that BoE independence is largely rhetorical, or possibly conventional, akin to the idea that Her Maj is actually in charge of government. @gastro george, you mean that the BoE board and governor are appointed by the UK government like the US Supreme Court is appointed by the US government, meaning that Scotus' independence is rhetorical or conventional? @Tim, the last time I looked we didn't have separation of powers in this country. Unfortunately, you seem to completely miss the point. The reality is that Right wing politics is by definition a charlatans game. Right wing policy is simply opposed to the wellbeing of the average citizen. The average man will never be wealthy and as such , a small state, less tax, more free market is not in his interest. Therefore in reality the Right cannot naturally have an electorate large enough to bring them into power. They have to lie and trick people into voting for them.
" I remember an old yokel in January 1910 , who told me he was going to vote Conservative (which was against his economic interests) , because he had been persuaded that if the Liberals were victorious the Germans would be in the country within a week. " "Right wing policy is opposed to the wellbeing of the average citizen". I can't speak for America but at least in european countries this is simply not true. Most people on the right genuinely believe that less market intervention and less taxes would be good for (almost) everyone. At times they're right! While a completely free-market economy is a real bad idea, too much state control can also be very harmful. For example, here in Sweden we have experienced many poorly thought-out left wing policies such as a top tax rate approaching 100% (as Krugman points out, 73% is the top rate that maximizes state tax income, anything above that is just populism) and huge tax breaks for companies that re-invest their profits (which caused the bigger companies to keep expanding while starving smaller and more profitable firms of the capital they needed). The right-wing coalition that ruled from 90-94 cleared away much of this rubble. For any American reading this, I should explain that the Swedish right wing is politically further to the left than the american left-wing. As Wren-Lewis often points out in this very article, neither side cares much about the truth. Looking at what the two parties have done historically, it's hard to say which one has been better at running the country. To be honest, though, poorly thought out left wing policies are probably considerably less harmful than poorly thought out right wing policies. "Nobody, but nobody denies that running a looser fiscal policy leads to higher short term growth." Hmmm. Thing is thought, this being politics that we are talking about, PLENTY of people have argued the logical equivalent - that tighter fiscal policy doesn't harm growth. "So how much will the cuts hurt the economy? I discovered that research into dozens of past fiscal tightenings shows that, more often than not, growth doesn't fall but accelerates. A study in 2003 by the European Commission found that of 74 consolidations examined, in 43 cases growth accelerated. In the mid-1980s, Spain, Portugal, Denmark and Ireland all had to rein in large deficits and their economies grew as a result. Finland, Sweden and Italy found the same in the mid-1990s. After the large cuts made by Canada in the 1990s, its economy then grew. More recently, after tackling its deficit, Sweden is growing at more than 4 per cent." " As the independent Office for Budget Responsibility has made clear… growth has been depressed by the financial crisis … the problems in the Eurozone … and a 60 per cent rise in oil prices between August 2010 and April 2011. They are absolutely clear that the deficit reduction plan is not responsible. In fact, quite the opposite." Osborne's 2009 talk of "expansionary austerity"
Juncker in 2010 telling us that fiscal consolidation will lead to enhanced growth through confidence. Our government has fallen straight into the correlation marked sharply shrink the welfare state / charlatans and cranks (Krugman blog December 10, 2013 'Empty Boxes of Political Economy'). I think SWL hits the nail on the head when he notes that the conservatives' pledges are designed to cause difficulty for Labour's baseline strategy of pledging to match government fiscal plans at first, and will prove a hostage to fortune if they are re-elected. But I don't think today's career politicians care; they will cross that bridge if and when they come to it, and their priority is to get past the next election to reach it. And the strategy will discomfit Labour, because they are also career politicians who dare not risk a radically different strategy of being straight with the voters about the size of the hole Britain is in. Labour's own unrealistic strategy is to bang on about the "cost of living crisis", with the implication that they would do something about it, without more detail than the odd populist raid on business. And the truth is, I suspect, that even a recovery in productivity would not fix this, because domestic production is not the same as consumption, and globalisation means that the terms of trade move against us. So the auction of undeliverable promises continues as we gently sink into civilised impoverishment. Sorry, my above comment is at the wrong level - feel free to delete! Conservatives see the economy as an incomprehensible force that can only be feared and blindly worshipped. We must fear and sacrifice to the mighty economic god who works in mysterious ways. They believe this because they have no real understanding of economics, so everything to them is incomprehensible and scary. Everything to them is about "morality". The rain didn't fall because we were bad people, so we must make sacrifices to the mysterious rain god. The economy didn't work because we were bad people. So we must make sacrifices to the mysterious economic god. In their mind we are always on the edge of inexplicable doom because of our sin and all those "big scary numbers" that they don't understand. Re the European Commission study of 74 consolidations, Keynsians certainly need to answer the basic claim of that study, namely that consolidations are followed by improved growth about half the time. Going thru that work in detail would take a lot of time. But my provisional and perhaps glib answer to it is thus. The consolidations were all during a time of reasonable economic growth (1980s and 90s): exactly the sort of scenario in which you would expect a government to be able to consolidate without any problems. Indeed, given enough private sector exuberance, government HAS TO consolidate, else there’ll be excess demand and inflation. The same thing was going in the US at that time. I.e. Bill Clinton ran a surplus during his presidency (1993-2001). But I don’t think it was the surplus that CAUSED the decent economic growth in the 1990s in the US. "Free school meals for all children in the first 3 years of primary school benefits better off parents, as those on low incomes can already claim"
This is a bit simplistic, as (a) many of those eligible for free school meals (FSM) don't take it up, often because of the stigma attached to being a FSM child, and (b) given rising food prices and stagnating wages, growing numbers of households who don't qualify for FSM are also struggling to provide enough healthy food for their children. You could see this policy as a public health measure as much as a sop to the middle classes. You are right, and I was aware of this when writing. The IFS discussion that I link to makes similar points to yours, and is therefore more nuanced. What I had in mind is that while this policy is designed to help many low income families, other government policies are directly increasing poverty. I guess what is happening is that the LibDem part of the coalition is trying to minimise the damage caused by other aspects of government policy, and specifically their welfare changes. Ah - would that I had time to follow up all your links...!